The team at Plaid loves all things custom and DIY, so we had to put our own twist on a trend that has seen a resurgence - personalized mugs and tumblers! Whether you're looking to make drinking water more fun or want to elevate the look of an existing mug, here are a few ways you can put your own spin on your favorite water bottles, coffee mugs and cups. Let's get crafty! One way to bring the fancy to your tumbler is to add sparkle! Glitterific packs the punch with multi-sized glittered flecks in a clear paint. Apply some Glitterific to a 1 ½” Sponger and dab onto the bottom of the bottle. Continue to dab all along the bottom of the bottle, applying more Glitterific to the bottom and applying gradually less as you go up the bottle to create an “Ombre” effect. Let dry. Clean the water bottle with soap and water to remove any oils from the surface. Let dry. Pour a generous amount of Hot Pink, Aqua and White Marbling paint onto a clean poster board. Pick up the poster board by the edges and tip it back and forth in a swirling motion to create a marbled pattern. Add more marbling paint if any holes need to be filled in. Holding the water bottle by the bottom and the lid, gently roll the bottle through the poured paint. Be careful not to apply too much pressure- just enough so that the surface of the bottle gently touches the surface of the paint. Let dry. We had so much fun detailing this cup with paint from blowing bubbles! It gives a light, water-color effect for those that love a more subtle look. Try a reliable paint that looks great on any surface like FolkArt Multi-Surface to crush this project. Pour 2 tablespoons of Lavender into a paper bowl. Pour 1 tablespoon of dish soap into the same bowl. Combine the soap and the paint completely with a spoon. Pour ¼ cup of water into the bowl and stir with the spoon until combined fully. Place the drinking straw in the bowl making sure the end is touching the bottom. Blow into the straw to make bubbles, being careful not to inhale. When you have bubbles that are several inches above the top of the bowl, set the straw aside. Dip the thermos into the bubbles and pull back out. Blow more bubbles into the bowl with the straw and dip a different side of the thermos. Continue this until you are pleased with the amount of bubble patterning on the thermos. Let dry. Apply the “Drink Me” stencil to the front of the thermos. Using a 5/8” detail painter, stencil the words in Cayman Blue. Let dry. 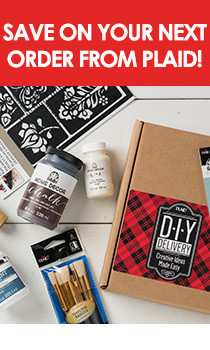 Try customizing your favorite cup or mug and share with us using #PlaidCrafts on social!